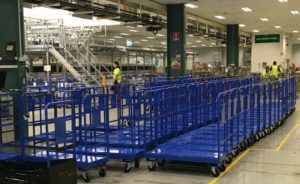 In August 2017, Australia Post identified the need for a number of custom warehouse trolleys to suit processing around new mail sorting automation. Based on the experience of other postal organisations, an existing trolley from a German manufacturer was originally considered. Wanting to involve local manufacturers if possible, Australia Post approached Bremco Metal Products. 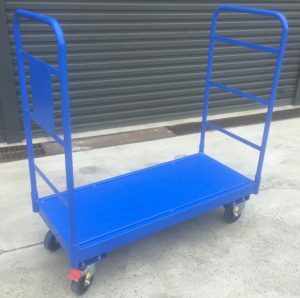 Working closely with Australia Post to develop a prototype trolley, submitting 3D drawings for approval, and refining the solution with a number of samples, Bremco’s warehouse trolley design was approved by Australia Post. The Bremco pricing per unit was also competitive with the German trolleys, which was further incentive for Australia Post to order a locally made product. The custom trolleys Bremco designed for Australia Post. The Australia Post Northgate Mail Centre purchased 160 units and their Melbourne site purchased a further 100 units. Jadd Brammall, Automation Program Manager at Australia Post, was responsible for implementing the Large Letter Storage Trolley into both sites. Jadd was very satisfied with Bremco’s work. To find out more about Bremco’s custom metal fabrication services, contact the Bremco team today. You can also view Bremco’s warehouse trolley range here.